Summer is the best season to experience Mount Wudang, a mist-shrouded Taoist Mecca in central Hubei province. Most visitors arrive in the morning, pay homage at the Taoist monasteries, climb a stairway to the awe-inspiring Golden Palace on the mountain peak, and leave at dusk. 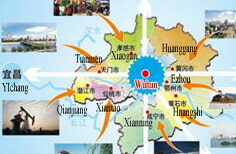 A handful choose to stay for a night or two, so as to enjoy a more relaxed tour of the scenic spots. 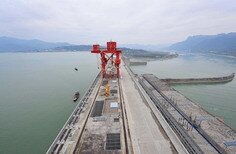 Fewer still, such as Elizabeta Skuber Osterman, a Chinese studies expert from Slovenia, stay longer to experience the natural beauty of the mountain, Taoist culture and the legendary Wudang kungfu. Osterman has been training at the Wudang Taoist Kungfu Academy since April. 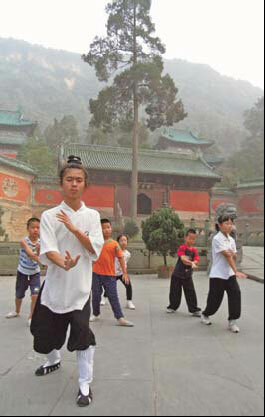 The 21-year-old Wudang kungfu training center near Purple Heaven Palace is the largest and best-preserved Taoist compound on the more than 1,600-meter mountain, which is the headquarters of the Wudang Taoist Association. Under the leadership of the association, the organization has drawn increasing attention from kungfu enthusiasts seeking an alternative destination to the Shaolin Temple in central Henan province. Osterman's one-month stay at Wudang was a 60th birthday present from her son, daughter-in-law and friends in 2009. "I had a great time, lots of exercise, Taoist philosophy and meditation under the tutelage of such kungfu masters as Guan Yongxing and Li Tengfei," says Osterman, who visits again this summer. Taoist kungfu teacher Ming Zhengwang guides a special class for kids. 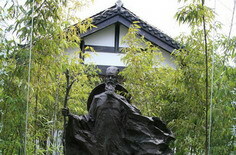 The daily routine included a morning Taoist scripture chanting session at 5:30 am in the temple, morning and afternoon training sessions in Wudang tai chi, and Taoist lectures in the early evening. She also learned traditional Chinese healthcare from Taoist doctors such as Wang Taike and Zhu Huaying; and learned to play the guqin, the seven-stringed, plucked Chinese instrument, from Taoist nun Fang Chongyi. She describes Wudang as a "holy land" of "extraordinary Taoist kungfu masters, magnificent natural beauty, pure-hearted nuns, warm-hearted priests, as well as refreshing vegetarian foods". In Osterman's view, Taoism is not just a metaphysical theory but a better way of life. "Being modest, natural, retaining tranquility and purity of the heart are the greatest treasures that I have received by studying Taoism and practicing Taoist kungfu," she says. Jackie Sheargold, a massage therapist from New Zealand, shares the same passion as Osterman. She has visited the academy for five consecutive years, to improve her tai chi skills. Back home, Sheargold has practiced qigong, and tai chi for at least 10 years, and has used Traditional Chinese Medicine (TCM) to help cure her clients. "I have progressed to the point that I am really enjoying Taoist philosophy and I'm trying to incorporate it into my life," she says. 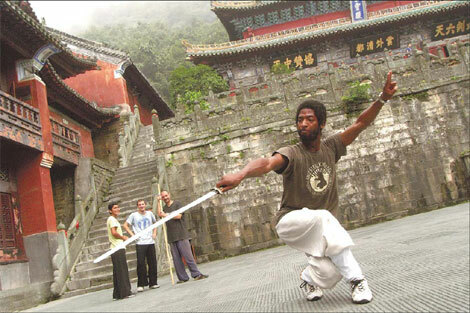 For Raphael Robert Zanders-McNeil, a Chinese language major from San Francisco, learning Wudang kungfu has been a dream since he was a teenager when he watched a movie featuring Wudang Taoist warriors.